Adult onset Still's disease (AOSD) or Wissler-Fanconi syndrome is a rare systemic inflammatory disorder of unknown etiology, characterised by quotidian high spiking fevers and evanescent (transient) salmon-colored rash,Adult onset Still's disease (AOSD)or Wissler-Fanconi syndrome is a rare systemic inflammatory disorder of unknown etiology, characterised by quotidian high spiking fevers and evanescent (transient) salmon-colored rash, arthritis, and multiorgan involvement. arthritis, and multiorgan involvement. OMIM single gene "Still disease, adult-onset"
It owes its name to George Still who published in 1897 his monograph, On a form of chronic joint disease in children, describing 22 children with signs and symptoms of the disease entity currently known as systemic onset juvenile idiopathic arthritis. In 1971, Eric Bywaters described 14 adults with similar presentation with paediatric Still's disease, convincingly establishing the new disease entity. However, the first description of an adult patient with signs and symptoms of AOSD, erroneously labelled rheumatoid arthritis, was published in the Lancet in 1896, one year before George Still's monograph1. Adult-onset Still's Disease is rare and has been described all over the world. Prevalence is estimated at 1.5 cases per 100,000-1,000,000 population. There is a bimodal age distribution with one peak incidence between ages 15–25 and a second peak between ages of 36–46 years2. A Japanese study attempted to design classification criteria for adult Still's disease. -	A fever (equal to or greater than 39°C) that comes on quickly once per day, usually in the afternoon or evening. For most people, these fevers resolve without treatment. -	Joint pain, warmth, and swelling affecting a few joints at first -- often knees and wrists -- then several joints. ( Especially carpal and tarsal ankylosis ). Morning joint stiffness often lasts for several hours. -	A salmon pink-colored skin rash that usually comes and goes with the fever and is usually not itchy. Flat spots or both flat spots and small, raised bumps may appear on your torso, upper arms or legs, or face. Requiring 5 or more criteria including 2 or more major criteria yielded 96.2% sensitivity and 92.1% specificity. Sometimes thoracic pains suggestive of effusion (presence of liquids) or infiammation (pleuritis) in the pleura or around the heart (pericarditis). Frequently, the clinical presentation, is “incomplete”, that is, only 1 o 2 signs are presents. However, an exclusion process will be needed for an accurate classification, since this disease is relatively rare. The orientation of the sign and synthoms are important to make a diagnostic hypothesis, that may be confirmated from the laboratory exams, like neutrophilic leukocytosis and especially the value of ferritin . glycosilate in a good way. 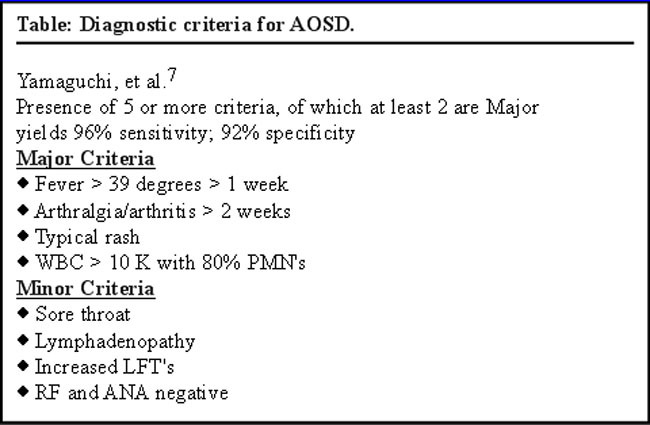 There are no specific laboratory tests for AOSD, but there are studies in which it is examinated the potential role of adenosine deaminase in the diagnosis. -synovial and serosal fluids demonstrate sterile inflammatory exudates. In the absence of any familial aggregation, the integration of Still’s disease into the group of monogenic AIDs needs to considered the hypothesis of pro-inflammatory cellular pathways and in particular the fact that this pathology probably is mediated from cytokine (role of the IL-1 family). Also it was really tempting to examine the possible implication of mitochondrial metabolism, since concordant works recently stressed the role played by mitochondria in the innate immune process. Interleukin-1β (IL-1β) and IL-18 contribute to host defense against infection, that one of the factor that probably triggers the syndrome, to the by augmenting antimicrobial properties of phagocytes and initiating Th1 and Th17 adaptive immune responses. Protein complexes called inflammasomes activate intracellular caspase-1 autocatalytically, which cleaves the inactive precursors of IL-1β and IL-18 into bioactive cytokines. It seems that the role of IL-18 isn’t important to the cytokine production, but is fundamental for the amplification of the signal. The major role is playing by a group of molecules called DAMPs (as ATP, uric acid. Etc.) , that are important to signalize that the pathogen is really dangerous for the survival of the cell. The mitochondrian, standing for the whole ensemble of mitochondria in an individual, not only produces the energy necessary to the cell, but also contributes, in certain conditions, to the activation of the innate immune system and to the systemic inflammatory responses. All these molecules can induce or amplify the tissutal lesions observed in different inflammatory diseases. Of note, the reactive oxygen species produced by dysfunctional mitochondria, together with the inhibition of mitophagy, can activate NLRP3 inflammasome . Moreover, it has been speculated that an NLRP3-binding protein could be released from dysfunctional mitochondria . The very high levels of PMNS that is usually registered during bouts of Still’s disease could be related to the fact that PMNs are the main target of MTDs. There are not risk factors knowed for this pathology, but there are negative prognostic factors, that are important to the therapy and to make a correct follow up. There are three types of manifestation, that are important for the therapy and prognosis: monocyclic systemic ( 26% of the patients with only 1 episode of systemic manifestations, followed by complete remission within 1 year after disease onset); polycyclic systemic (30% of the patient >1 episode of systemic manifestations, followed by partial or complete remission after onset of the initial or the subsequent attack); and chronic /persistent articular ( 44% persistent arthritis involving at least 1 joint area, lasting >6 months). the type chronic /persistent articular manifestation and the high level of ferritin. individual areas of inflammation. Many symptoms are often controlled with anti-inflammatory drugs, such as aspirin or other non-steroid drugs (NSAIDs). medications that affect the inflammatory aspects of the immune system are used. very promising in treating Still’s.